With cloud-based solutions comes the need to move data between applications. Software as a Service (SaaS) applications from companies like IBM, Salesforce, Oracle, Workday and SAP are increasingly attracting new customers. Gartner predicts worldwide SaaS application revenue will reach $22.1 billion by 2015. This creates a huge opportunity for companies specializing in data integration or more specifically hybrid data integration which combines internal/private cloud data with public cloud data. In March of 2015, Gartner released a new Magic Quadrant for Enterprise Integration Platform as a Service, Worldwide (iPaaS). Originally, this focused on point-to-point integration across cloud and on-premises applications -- Enterprise iPaaS offerings now effectively target more-complex uses. This Magic Quadrant helps directors of integration assess providers' ability to deliver offerings that meet current and evolving needs. The Garner report explains that iPaaS delivers some combination of capabilities that are typically found in enterprise service buses (ESBs), data integration tools, B2B gateways, managed file transfer products and API management platforms. IT departments, line of business (LOB) developers, mobile application development (AD) teams, application teams and even business users (aka "citizen integrators") leverage these capabilities to develop, execute and manage integration interfaces (or "integration flows") in the cloud. 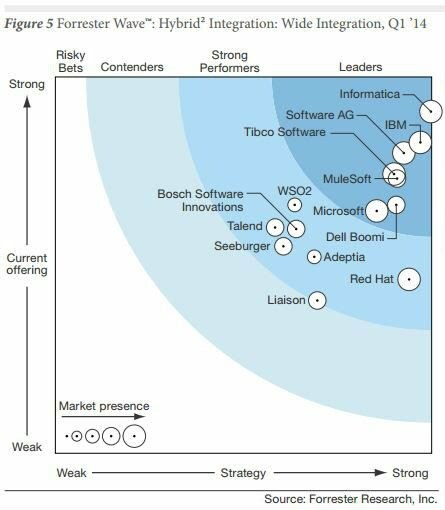 Forrester examined the market in 2014 and created "The Forrester Wave™: Hybrid2 Integration, Q1 2014" paper which explores the offerings from the 14 most significant middleware providers -- Adeptia, Bosch Software Innovations (Bosch SI), Dell Boomi, IBM, Informatica, Liaison, Microsoft, MuleSoft, Red Hat, Seeburger, Software AG, Talend, Tibco Software, and WSO2. This report details their findings about how well each vendor fulfills Forrester's criteria and where they stand in relation to each other. This is designed to help CIOs select the right partner for their hybrid² integration needs. Here is an example of the Wide Integration Overview that you will find in the complete paper.